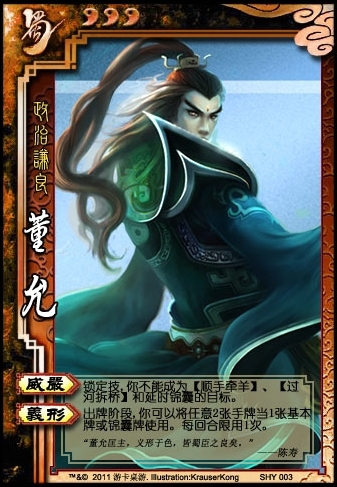 Dong Yun cannot be the target of steal, break, or any delay tool card. Once per turn, Dong Yun can use any two hand cards as any basic or tool card. When Lightning is going around, it simply passes over him to go to the next person. Dong Yun cannot play the Lightning itself since it would have to be placed on him. Dong Yun cannot use "Body of Justice" outside of his turn.